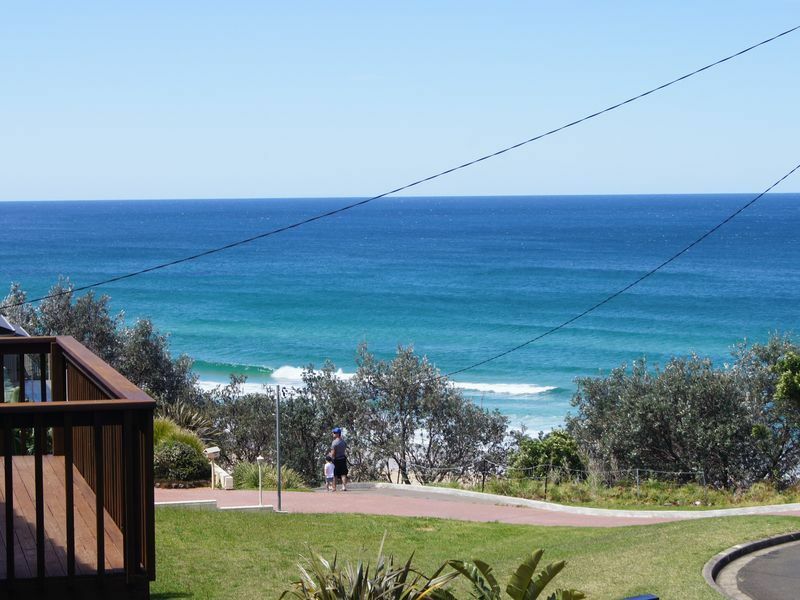 A spacious Beach House overlooking Rennies Beach where you can enjoy a relaxing holiday of beach and scenic ocean views and just a 50m stroll to the beach. Located opposite nature bush reserve and diagonally overlooking Rennies beach from balcony and bedrooms. This recently painted, carpeted comfortable beach house has a renovated kitchen with dishwasher, oven, stove-top and microwave. 2 new bathrooms, 4 bedrooms, two living areas; upstairs and a large rumpus room or separate unit downstairs. It also has a large covered entertaining and BBQ area at rear or property with established Gardens. The beach house is located in a quiet street overlooking Renneis beach. It is just 7 -10 minutes walk to Ulladulla town and harbour where there are plenty of cafes and restaurants, a cinema and Coles, Woolies and Aldi. Walk to Rennies beach, The Bommie, Pockets or walk through Bushland Native Reserve to Racecourse beach. Also Narrawallee and Mollymook beaches & 2 Golf course beaches close by. 10 mins drive to; Burrell Lakes which is great for boating, fishing, water skiing, or pawning. Visit Historical Milton Art galleries and local shops also 7 mins drive away. Facilities - Unit 1 Upstairs sleeps 6, Downstairs unit sleeps 2. or 8 when both are combined. Bedroom 1 - Main bedroom has Queen Size bed with beach, ocean and Native Reserve views. Bedroom 2: - Double bed with ocean and Native Reserve views. Unit 2 downstairs can combine with upstairs as a rumpus room down stairs. Double sleeps 2. We recently stayed at this property and I have to say that we were very disappointed with the standard of the house given what we paid for it. The decor of the house is very dated and parts in disrepair (e.g. windows and doors difficult to open and close and then not sealing properly), the furniture was of very poor quality and again very dated and a general standard of cleanliness was lacking across the board. The only saving grace of this house is its proximity to the beach. Had the house been pitched at a lower price point we may not have been so disappointed in comparison to some of the other beautiful properties on the south coast. Fantastic location overlooking Rennies beach and only a short walk into town! Plenty of indoor and outdoor space for all the family to enjoy. Everything you need for a long weekend away plus bedding & towels were provided which was a bonus! Foot steps to the beach. Scenic near by bush walks. Pet friendly. Walking distance to shops. Welcoming holiday vibe!! Thanks Dean. I am glade you had a great time! We had the most amazing time. Your home is beautiful and we loved the small touches like the new soap in the bathroom to the use of pantry items if needed. The house itself is beautiful and we had such an amazing view of the beach. I did take some rosemary and passionfuit. Location was also fantastic, so close to town easy to find and easy to get to and from by using the back streets. Wonderful location on the foot steps of a beautiful dog friendly surf beach and only a short stroll into town. Spacious back yard, fully equipped kitchen, comfortable house and very homely! A wonderful choice for a family vacation or weekend away with friends! Thanks Alison, we are glade you liked the beach house as much as we do and you had a great stay. We look forward to seeing you next time!